Russia sentenced an Estonian security officer to 15 years in prison for spying in the latest in a series of politically charged trials. A regional court in the western Russian city of Pskov handed down the ruling Wednesday, finding Eston Kohver guilty of spying, arms smuggling and violating border regulations. Russia said Kohver illegally crossed the border into Russia in September 2014 and was apprehended. Estonia said Kohver was kidnapped by unknown gunmen and taken forcibly across the Russian border. Estonian officials said Kohver was investigating a smuggling operation involving Russian intelligence agents. The verdict brought swift international condemnation and calls for Kohver’s release. Estonian Prime Minister Taavi Roivas said in a Twitter message that Kohver's "illegal detention constitutes a grave violation of international law." Roivas also released a statement shortly after the verdict, saying Kohver's "abduction" and "illegal detention" has been "illegitimate since the beginning." Roivas said Estonia is doing everything possible to obtain Kohver’s release. U.S. State Department spokesman John Kirby called the charges against Kohver "baseless" and said the case raises serious concerns over Russian compliance with its interrogational legal obligations. Kirby said in a statement the U.S. is troubled by reports Kohver did not receive adequate legal representation and that neither the public nor Estonian consul was allowed in the courtroom during the trial. "We call once again on the Russian Federation to act in accordance with its international obligations and immediately return Mr. Kohver to Estonia," the statement read. The West also has accused Moscow of sending troops across its border with Ukraine to support separatist rebels. Moscow has repeatedly denied those accusations. EU foreign affairs chief Federica Mogherini said Kohver's abduction and detention violated international law. "Mr. Kohver has been deprived of the right to a fair trial: there was no public hearing of the case," Mogherini said. "The EU continues to call on the Russian Federation to act according to its international obligations, release Mr. Kohver immediately and guarantee his safe return to Estonia." 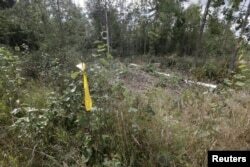 Estonian officials said the abduction appeared to be revenge for an investigation Kohver was conducting into cross-border smuggling. Russian media said Kohver will be sent to a high-security, hard-labor prison in Russian territory and will also be fined the equivalent of about $1,500 U.S. dollars. The smuggling allegedly involved criminal gangs linked to Russia's Federal Security Service (FSB), the successor to the Soviet Union's KGB. The FSB, who detained Kohver, said he was armed and had documents and audio recording equipment indicating he was engaged in espionage. Kohver's lawyer told local media he can still appeal to Russia's Supreme Court. Tanya Lokshina, Russia program director for Human Rights Watch, noted a string of politically charged trials ranging from a Ukrainian film director and a Ukrainian pilot to a Russian mother accused of treason. "In recent years, the Kremlin has been positioning Russia as a besieged fortress, a fortress surrounded by enemies. Whereas the West is certainly this enemy No. 1. So, one may argue that those trials are also part of the same trend ... spies, traitors and enemies ... being displayed before the public," Lokshina said. Wednesday’s ruling will further strain relations in the Baltic region, where tensions have risen after Moscow's annexation of Crimea last year and support of Russian-speaking rebels in eastern Ukraine. Baltic states, such as Estonia, were among the most outspoken critics of Russia's actions in Ukraine. They raised concerns that Moscow could take similar action to foment unrest among ethnic Russians in other former Soviet territories, including the Baltics. NATO, the Western military alliance, has said Russian fighter jets are probing into European airspace at a rate not seen since the Cold War. FILE - Oleg Sentsov sits behind glass in a cage at a court room in Rostov-on-Don, Russia, July 21, 2015. Also Wednesday, public prosecutors in Russia's Rostov region asked judges for a 23-year sentence against a Ukrainian film director. 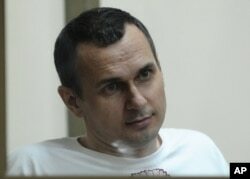 Oleg Sentsov faces charges of leading a terrorist group and acts of terrorism for what rights groups say was simply opposition to Russia's occupation of Crimea. Lokshina said he is almost assured to be convicted when the verdict is read on August 25. Russia's FSB arrested Sentsov, and a co-defendant, in Crimea in May 2014, just after Russia annexed the Black Sea peninsula from Ukraine. They were accused of being members of a right-wing Ukrainian group and conducting arson attacks. Both men deny the charges and rights groups say the case is a politically motivated show trial that involved torture and forced confessions from witnesses. Sentsov said he was tortured, but Russian authorities shockingly claimed his bruises were due to his sexual preferences. FILE - Ukrainian military pilot Nadiya Savchenko looks out from a defendants' cage during a court hearing in Moscow, Russia, May 6, 2015. Another high-profile Ukrainian case, that of pilot Nadiya Savchenko, is due to resume Friday when a Rostov court decides whether to move her trial back to Moscow. The pilot, who has been held since June of last year, is charged in the deaths of two Russian journalists in east Ukraine and for crossing illegally into Russia. 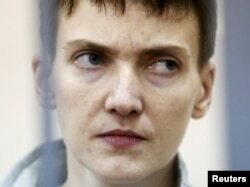 Savchenko denies the charges and says she was abducted inside Ukraine and taken to Russia. Her lawyers say they have proof she was already in Russian custody when the journalists were killed.